…a room with three other doors. Looking out the windows my feet crushed something on the floor. “Watch your step here,” I warned them. I’m always ready to be helpful with the less important things. “Look at those two trees out there,” one said, looking over my shoulder, which is not easy to do. Now they realized that it could rain where they were going. Not sure if anyone noticed this, but the VIII is the middle number on the stone. And 8 is the middle door on the wall. I like also the note someone made that it was the 8th window pane broken. Recent poster Germaine’s screen name gave me an idea for this room. Apparently it is difficult to look over the Guide’s shoulder. Possibly because he has a “chip” on his shoulder. Or a computer chip??? i mentioned this before but never followed up with a pic. well here it is! combined with the glove prompting you to count your fingers, is this any good?? I spent some time with this solution assessing the pros and cons. I believe that I was in error not confirming it before. In the woods where I grew up there was an abandoned building with a door just like these with four horizontal reveals. Similar doors were in neighbor’s houses and out buildings. An extensive internet search did not turn up a single example of this style of door. Apparently, though not uncommon where I am from, this style of door is quite unusual. Also this is the only four reveal door in the book, all the others with reveals are single or double. Further helping this solution is that the door to the left is tilted. And, perhaps the clincher, the width of the pole of the hat rack is exactly the same as the width of the chair rail on the wall. Congratualtions! And also my apologies for not seeing my blind spot sooner. If a room is already a 5 and you get another solution does that mean you are the new cluemaster? Seems fair to me… officially handing over my Cluemaster tiara. I think it will look very nice on you, sp. ‘Everything right now’, ‘nothing now’, ‘the time is now’. Maybe ‘nothing now’ is a bit weak but the other two complement the time of day syncing with the sun picture, which reinforces Vince’s idea about now being 8 o clock. I didn’t want to add the O solution until the other ones had been found because I am not sure of the authenticity of the source. Next time I talk to Manson I’ll ask if he did confirm this solution. i wasn’t aware that asking manson about specific puzzle solutions was kosher? i thought he was reluctant? does this not apply to you? You’re talking about the email from the John Bailey site, right? That’s a good question, actually; it was very ambiguously written. I tend to assume that the information contained in the email included the corrections that Manson had given, but it’s far from clear. This line of questioning would fit well into that question on the Ask Manson page that nobody seems to like. I believe this is the only case in which Manson himself may have revealed an answer. My question simply is, did you? I do not think Manson would have a problem with this question. In regards to questions about solutions. Manson doesn’t want to give hints or talk about ambiguous solutions. Which works great because neither do I. He will however discuss solutions which are fairly settled. For instance we have a solution for Room 22, I do not think he would have a problem saying yea or nay to this solution but he would not then speak of it further. Get this easy riddle and become the new Cluemaster General! 1. The three feet of the coat rack or whatever make the same shapes that 8 o’clock would on a clock. Imagine any of the shoes as the minute hand and the shoe immediately to its left as the hour hand. (Assuming the feet are exactly equidistant. The minute and hour hand on a clock when indicating 8 o’clock divide the clock face into one-third and two-thirds.) Perhaps the “hands” on top of the coat rack further make you think of a clock. 2. If you read “the time is” as “o’clock” then door 8 is the only one that works. 19 works for military time but you wouldn’t say “19 o’clock,” you’d say “1900 hours.” Maybe the fact that there is sunlight above the 8 shows that it is “8 o’clock in the morning,” which you wouldn’t need to indicate for military time. Ugh… this is incoherent. Well, the sun picture above 8 is the only one that matches the actual time of day. Over 28 we have the storm, which we are told in the text is just now starting up. Above 45, we see a nighttime scene, and above 19, though it’s just a picture of a damn foot, it’s clearly in darkness. One of the things that makes MAZE so difficult is that some of the riddles are crazy hard and others are super simple and it is difficult to make the mental transition between the two. I think Vewatkin has this one. The time is day, as in daytime, daylight. Putting it on the board, the room is now topped out and vewatkin is co-cluemaster with Aria (see Room 2). I think we’ve seen a similar situation before, and regardless of the order of the posts, the order of the acceptance of the solutions is what dictates the succession of Cluemasters. So, it looks to me like I am the current Cluemaster, but soon–perhaps before I even finish posting this–Aria will be the reigning Cluemaster. Fair enough! I bow to the wisdom of the Cluemaster Guardians as best how to dispense their award. It will take me a while to respond to Room 2 (it’s complicated) so you may be Cluemaster for a few hours yet! I contest that! I would totally use Aria’s typed drink recipes. Everything right is everything in the room. There are two tablets, two gloves, two patio doors. On the right side is of the tablets is the number that is with the right side of the patio doors and the right glove is open looking like an open hand tossing a ball. And NOTHING is the broken pane of glass. It says go with nothing, the hole through the eighth pane. Congratulations! You didn’t every last bit but you had the majority of it right (see the solution summary and related images for details). Adding it to the summary and bumping up the solve meter! Good job! help me understand how 5 relates to 8? Its not the 5s its 10s and we look at the 5s on the right which are 6 7 8 9 10. He made a picture to show this. This is A LOT better than what I had Im glad he took my solution without it. I have modified the summary to make it more clear, as LoMoody said it has nothing to do with the number 5 itself. I deleted your comment. Make a comment like that again and you are done here. i’m not sure 515 intended any insult. in fact, aria and i just mentioned that if that finger were up, it would be the 8th. but would also probably make the puzzle too easy. It’s tough spot to be in when your jokes are too profane for the Abyss and not profane enough for MazeCast. Actually, that’s a pretty broad window. I see your point. I thought it was just a random crass comment. I wasn’t objecting to the language but the trolling as opposed to discussing. My apologies to 515 for jumping to conclusions. The world has no respect for a FORMER Cluemaster. I anticipate the end of my reign with stoic dread. I love the humor on MAZECAST, but a lot of what is said there would seem strange if typed, like if Aria just started posting mixed drink recipes. Ha, yeah I was referencing the 8th finger and trying to be clever, not profane… or malicious at any rate. But I’ll keep it family friendly from now on ;) . Congrats to all these puzzle hounds and to the recently crowned Cluemasters General! Tune in to Mazecast to find out the rest. Everything Right Nothing The Time Is. Anagrams with letters are not working out too well, but maybe the words could be scrambled. 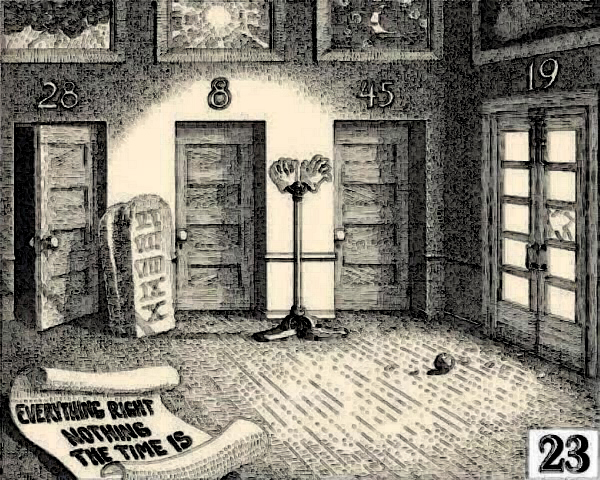 Perhaps “The Right Is Nothing”, suggesting that the two doors on the right are not the correct doors. That leaves Everything and Time. I’m not sure about Time, but forgetting that, it would be only Everything that is left. Everything is LEFT over, so you could say that Everything is Left. The Right Is Nothing, Everything is Left, and the correct door is on the left. I apologize if this was mentioned already… In the text, guide says “I’m always ready to be helpful with the less important things.” Meaning the 2 “thing”s on the scroll are not necessary? That leaves EVERY RIGHT NO THE TIME IS. 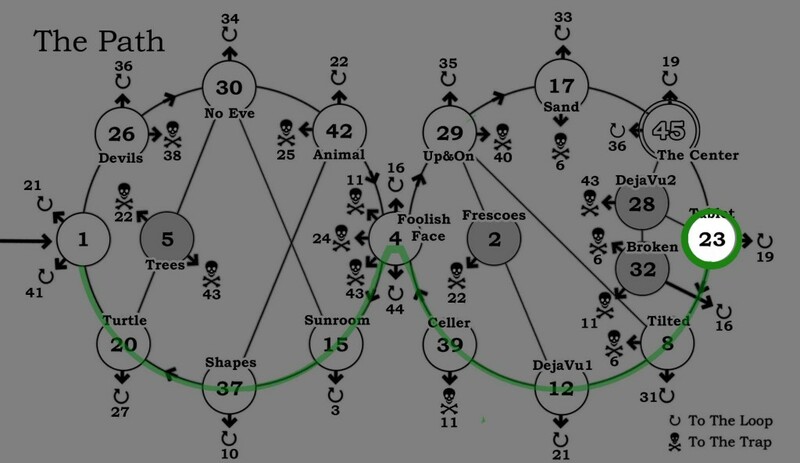 Lots of possibilities here, for example that can unscramble to “THEIR ENTRY MOVE IS EIGHT.” Or maybe there is a more important “thing” hidden in the message (thig from right, and the n from no = thing). TIME IS EVERY OTHER THING. Doesn’t make a ton of sense to me, but I’m new to this thing. Just spitballing. Also, NEVERMORE is in there too. Man, connecting “things” in the text with the “things” on the sign, that seems so reasonable, and we never thought of it! There may be something here indeed. Not in the anagrams, apparently, but it may be the start of something. This is the kind of observation that really gets us thinking, let’s see where it leads. Thank you for sharing! Welcome to The Abyss! New Mazecast from last night should be on its way. My only contribution of substance: I’m totally on board with the scroll giving us the letter O, but I also noticed that “EVERYTHING RIGHT” could point to 8 due to the digit 8′s resemblance to the symbol for infinity. If infinity is “EVERYTHING”, then it would be “RIGHT” to pick the door with that association. It seems to be officially called “Mazecast” now, as opposed to whatever things we repeatedly called it before. This is a very clever room: we have window pane/PAIN in the room. Two tablets/MEDICINE. The coat rack has overshoes/rubbers and gloves/RUBBER GLOVES. The note is a PRESCRIPTION so we can’t read it. The pictures on the one wall are “stormy”, “sunny”, and “partly cloudy”, WEATHER=the correct door is UNDER THE WEATHER. The narrative states “bumbershoot”/a pool SHOT off the cushion of the table with the EIGHT BALL(an eight ball is also a measure of street cocaine-a drug). The correct door is Door #8. In Room #8 there is a picture of a STETHOSCOPE. An important aside: the picture of the “big foot” is the MONSTER who is very large and it would be difficult to look over his shoulder-he is also a multiple character (another reason not to donate your body to science)one of many that I see visiting MAZE. The Doctor in the room is of course DR. FRANKENSTEIN…(I knew he was visiting here somewhere).